With Tommaso Ciampa officially relinquishing the NXT Championship due to injury, it was up to the creative minds in NXT to come up with a main event worthy of NXT's WrestleMania weekend. Papa H came out to declare that, due to the injury, Johnny Gargano had no opponent for the NXT Championship at NXT TakeOver: New York. He cut a passionate promo about the value of NXT, its championships and what the brand as a whole has always brought to the table. 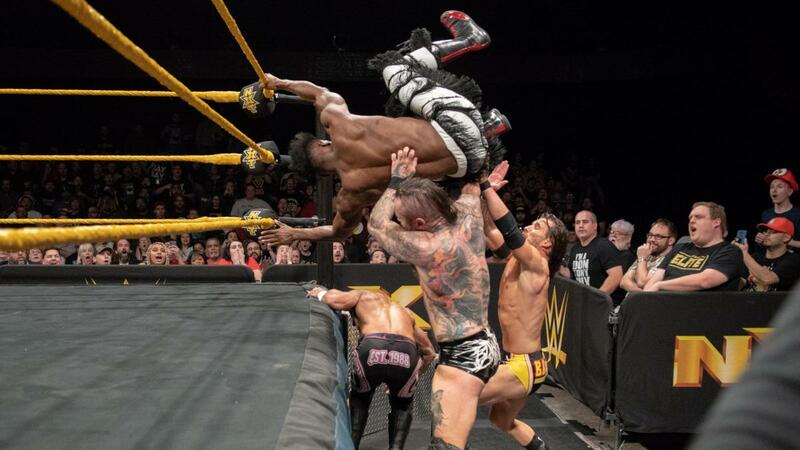 With that, he announced that he was giving opportunities to five of NXT's top stars in NXT North American Champion Velveteen Dream, Aleister Black, Ricochet, Adam Cole and Matt Riddle. Admittedly, a big bout such as this deserves to have the spotlight, and that is why the focus of the whole night was on the main event and its competitors. Remember that four of these five participants—Matt Riddle being a wildcard—had worked with each other in a multitude of storylines so the familiarity with each other was there. All five men brought their A-game and they were able to showcase their fighting chop—with Black and Ricochet even taking time to show respect before facing off. Also, Riddle's exchange with Black was something I didn't know I wanted until it happened. It was hard and it piqued my interest that I somehow want to see the two in a full-fledged one-on-one match next time. 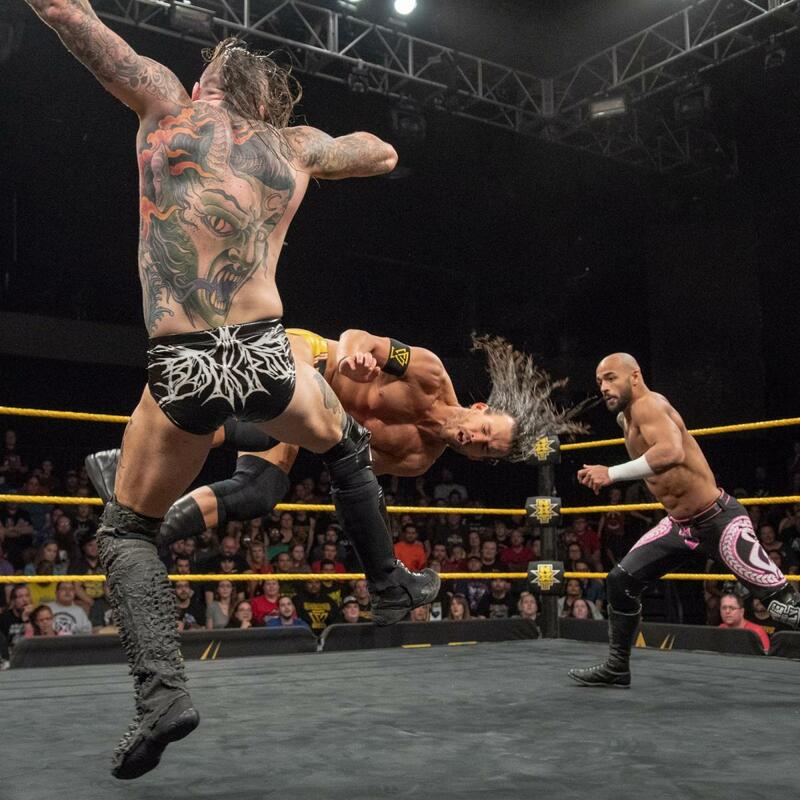 The ending would see a rapid exchange of finishers and signatures between all five Superstars where a token Ricochet outside spot would take out three of the men. A few seconds later, a death-defying Shooting Star Press from him would seem like the end for Riddle. However, the dastardly Adam Cole would hit hard with the Last Shot to the back of Ricochet's head to steal the victory, seal the deal, and become the contender for the NXT Championship to face Johnny Gargano at NXT TakeOver: New York. With all of this, we have our NXT Championship match set so allow me to dissect the competitors bit by bit as I point out my takeaways from this result. Adam Cole: Sure, the Undisputed ERA hasn't been a formidable force in recent weeks, but do remember that Cole was our first NXT North American Champion. A guy who has a lot of charisma and tons of upside, I'm excited for the stories he can tell with Johnny Gargano as they battle for the vacant title. I'm also hoping this isn't a one-and-done considering Gargano has been called up to the main roster. Velveteen Dream: He's the current NXT North American Champion. It's not surprising that he was a part of the match because he's that talented. If I had to pick an NXT Championship feud right now, I would want it to be Velveteen Dream vs. Adam Cole. Keep in mind though that a title defense against Matt Riddle was teased a few weeks back (and was announced just yesterday) so it's hard to believe Dream could've won here. Still, the Dream/Riddle face-off may just be the push that Riddle needs. Matt Riddle: As I mentioned, Riddle is the wildcard here, with this being his first taste of main event status. I'm sure the King of Bros has a bright future in NXT, however, I think the best way to build him up would be as he is booked—and that is challenging for the NXT North Championship. He hasn't had much steam after that disappointing rivalry with Kassius Ohno so this is a welcome development. 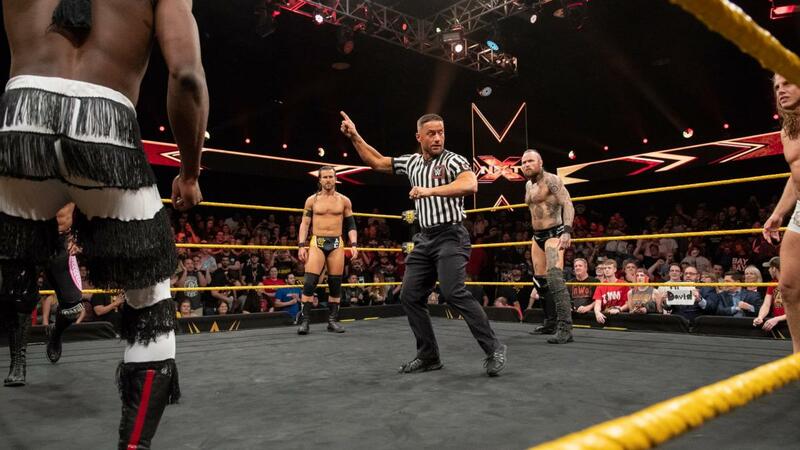 Aleister Black and Ricochet: Currently functioning as a unit on all brands, their loss here may have softly confirmed the fact that they're transitioning to the main roster full-time. I don't really see them winning the NXT Tag Team Championships from the War Raiders, though, I'm more than sure they'll win this year's Dusty Rhodes Tag Team Classic. (Side note: I haven't seen the spoilers from this batch of NXT tapings.) They might give the Raiders a hard time, but I have a feeling that it'll be a long time until Hanson and Rowe are dethroned. As an extra thought, let's discuss Johnny Gargano. Yes, he was originally supposed to face Ciampa for the NXT Championship at NXT TakeOver: New York due to their long-standing rivalry. Although, I wonder why he gets a free pass to compete for the title now that the title is vacant. Shouldn't he also be vying for the opportunity instead? On this note, I do wish they'd hold off on the Gargano main roster run as this feud with Cole might be pretty interesting, to say the least. The show was an absolute banger from start to finish and it was a good decision to just play this main event angle throughout the whole episode. It was able to establish all future storylines heading forward and the match itself was very entertaining. With Aleister Black and Ricochet now part of the main roster, their inclusion in the Fatal 5-Way makes little sense unless they're being pulled back. It does make for good TV time, so that's a good but shallow reason. I just sort of wished Keith Lee was part of this to make it a 6-Pack Challenge. The NXT Women's Championship match for NXT TakeOver: New York is set. I'm just excited that it's a multi-woman match. The inclusion of Io Shirai and Kairi Sane will make this more epic. Kona Reeves is the kind of guy you'd hate because he has such a punchable face. I somehow want to see him be victimized by NXT's up-and-comers just because of his smug looks. Did you agree with Adam Cole winning the match? Would you have preferred a different NXT Championship match for NXT TakeOver: New York? Are you excited for Velveteen Dream vs. Matt Riddle? Hit us up in the comments section below.